Posted by Jon in Review, Third Party, Transformers with 2 comments. 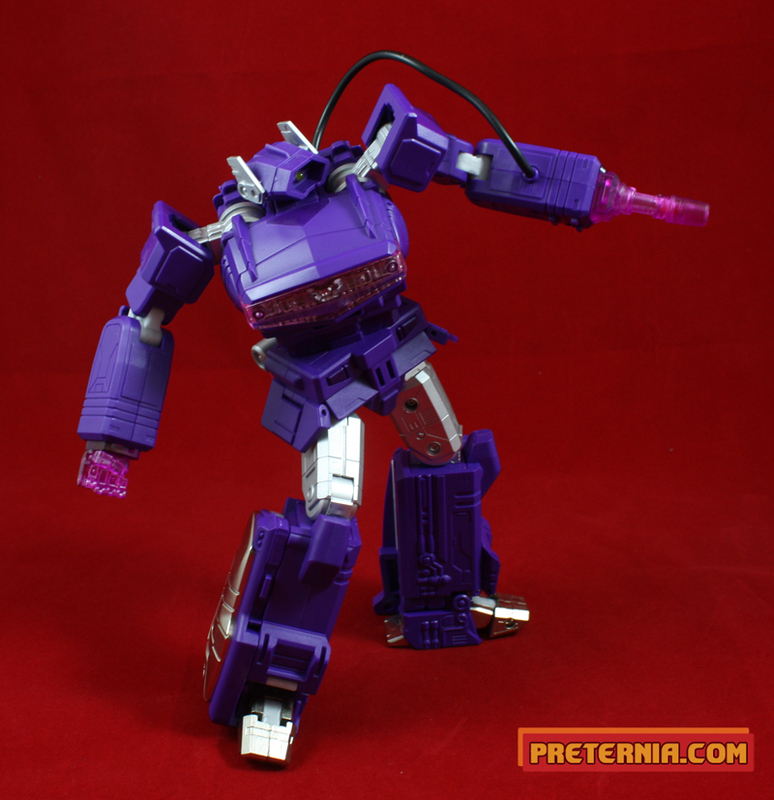 Now that Takara (and Hasbro) has given us wonderful Masterpiece rendition of Soundwave it is only fitting to want your collection to have Shockwave of equal MP quality. Takara seems to be very busy doing cars for the MP line, so this is where the third-party robot makers come in. 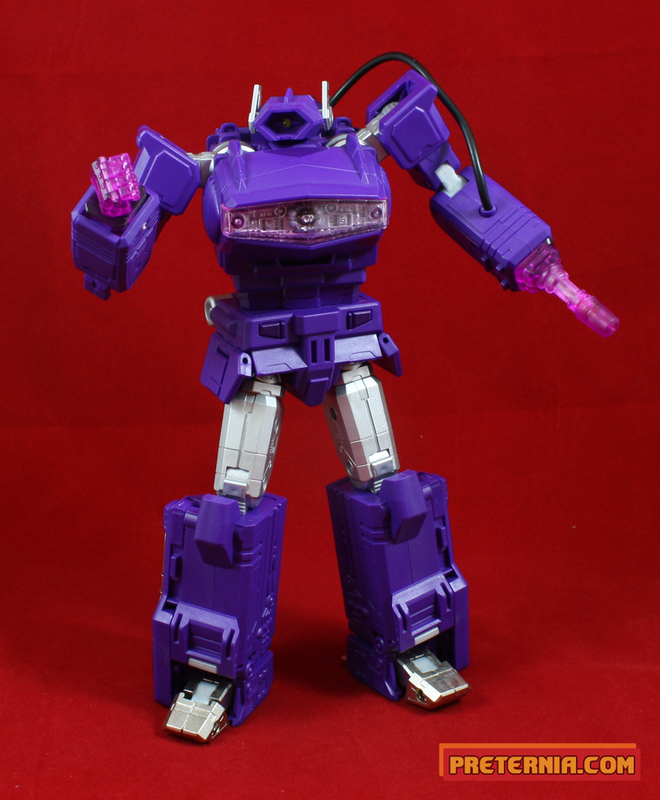 Fans Toys released Quake Wave (not-Shockwave) earlier this year to much praise from Transformers enthusiests. After hearing all the praise I decided to jump in on the Quake Wave bandwagon as well, and I’m glad I did. 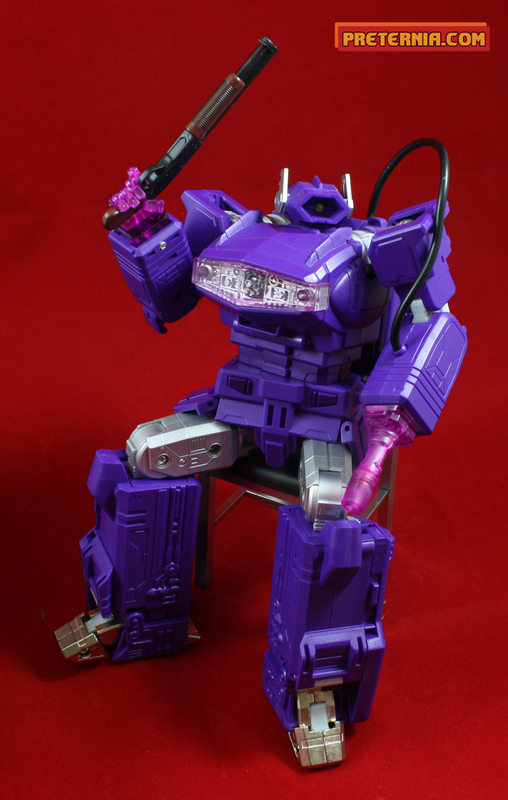 Quake Wave is my official Masterpiece Shockwave. Fans Toys put together an incredible figure that is as good as anything official out there. This is labeled as a quick review. Why is that? Because I’ve wanted to showcase some figures, but have not had the time to write up a full complete “review.” I think this is a decent enough compromise because I can show off the figure a bit and get some thoughts out. The full reviews aren’t going anywhere, but this will help doing things like variant figures and the like. Why is Quake Wave a quick review? Well, because I didn’t feel like transforming him into a gun. 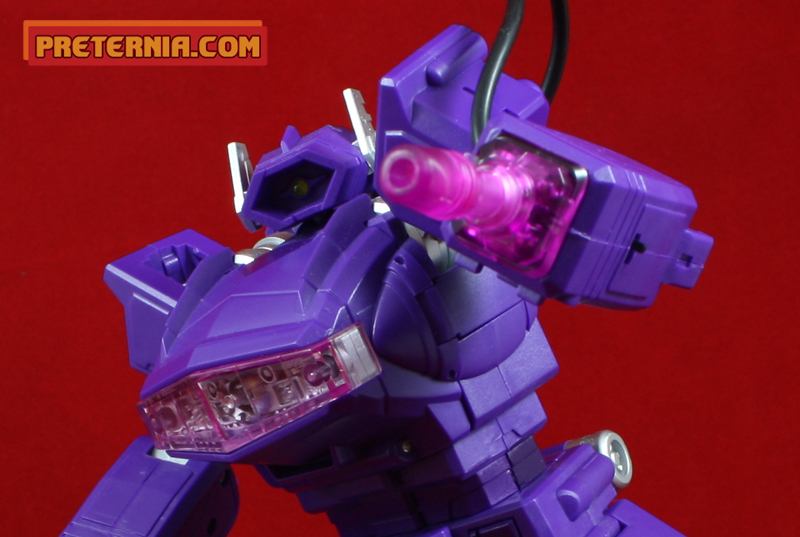 It wouldn’t be a complete review without pictures of his quite awesome gun mode. Now why did I not want to transform him into a gun? Because his legs that slide into the shin area are damn scary. It wasn’t bad getting him into the gun mode, but the amount of force I had to use to slide the legs back out scared me. I’m holding a $150+ toy and I’m not in the mood to go breaking him to try and get him in a gun mode that I would never keep him in for an extended period of time. Believe it or not I display most of my Transformers are in their bot modes. There are actually a few things I have not yet tried with Quake Wave. He comes with an extra set of solid colored hands that can replace the clear ones he has on his person. Installing them involves unscrewing a good majority of the forearm to put them in. I haven’t given this a try yet, however I am quite fond of the clear hands. There is also another kit included that allows you to run the hose under his arm which makes him more cartoon accurate. Again, this involves unscrewing and replacing some parts. For the more handy types this is great because Fans Toys give you a lot of options. It’s also nice that sites like Captured Prey shipped these out to people who already purchased the figure at no cost since they came out after the first batch of figures were made and shipped. I also neglected to put in the batteries to operate his LED lights. I really have become lazy, but I also am having a hard time finding the strange sized batteries the instructions say I should use. Maybe I’ll just bring Quake Wave into a Radio Shack and have those guys figure out what fits. Enough about my shortcomings though, this figure is incredible! 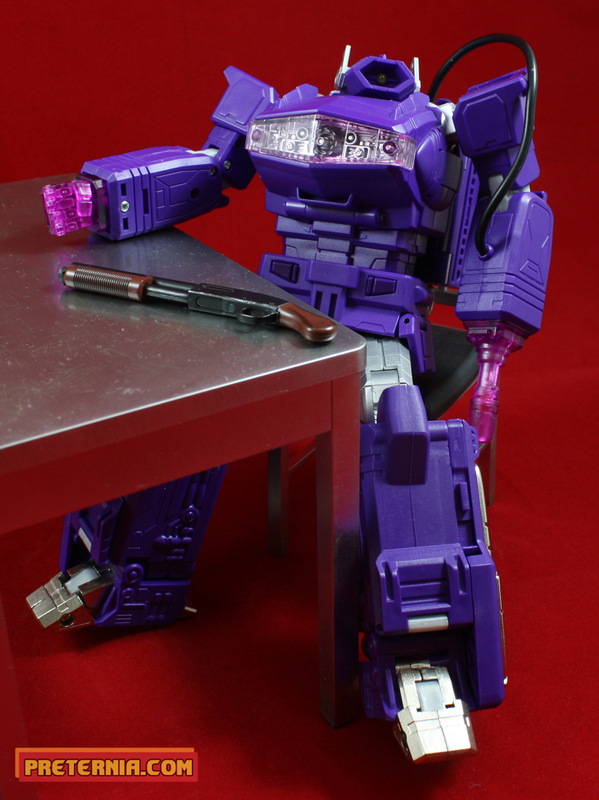 I’ve said a few times that you aren’t going to get anything closer to a Masterpiece Shockwave unless Takara decides to actually tackle the character some day. He’s got the proportions right and the articulation lets you get him in all kinds of poses. If there is any part that leaves something to be desired its his neck which really doesn’t allow a lot of movement. I think if the ball joint had been raised just a little I could get some really good head gestures out of him. One of the details that turned out really nice was the die-cast portion of the legs and feet. It adds a nice heft to the character, and the feet work really well keeping Quake Wave standing in most poses. Quake Wave was the figure we wanted, and the figure we deserved. He’s very affordable as a third party Transformer. He’s actually really close to the same price as Takara’s MP Soundwave, and since they are the same size it really feels like this guy is a great value. There have been three production runs of Quake Wave so far and now a few stores are offering a fourth. I have no idea when Fans Toys will actually stop producing this guy, but I wouldn’t wait too long because regardless of being third-party it’s a damn good toy. There have been three third party figures this year that are great values, and a great stepping stone into the genre for you first timers: Quake Wave (not-Shockwave), Demolition Crue (not-Top Spin and Twin Twist), and Hexatron (not-Sixshot). Any three of those are the best value off-brand Transformers you can currently find on the market. I think they all are also the best figures to try out if you want to dip your toe into the third-party market. Check out my reviews of the other two to see my thoughts. 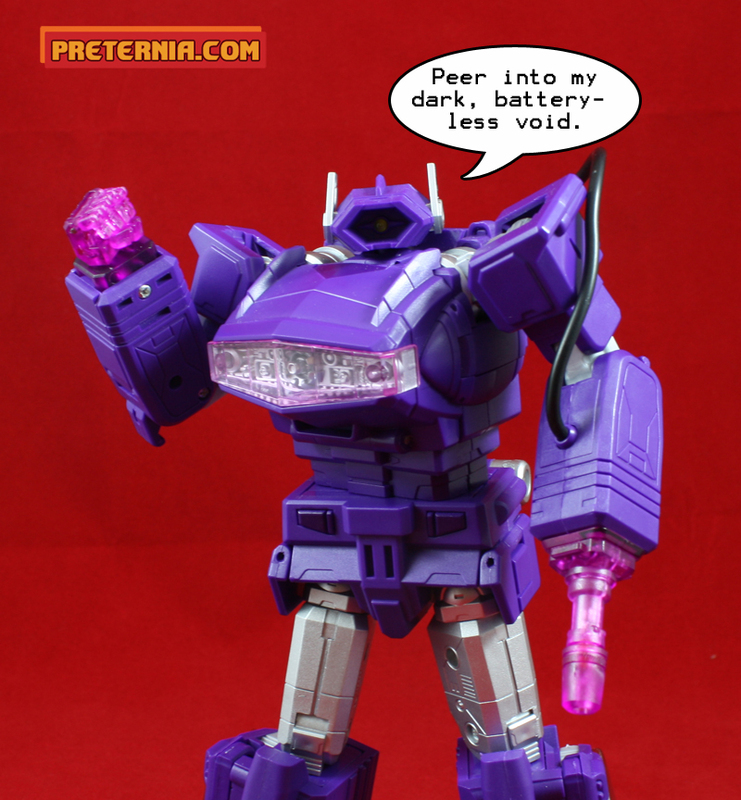 Great quick review..I love hearing about you not wanting to transform him!